Talk With Yah-Tay: Madiba "THE MAN"
One week ago today (December 5, 2013), we lost one of the world’s most influential leaders and role models. Nelson Mandela, the first South African Black President, lived a life that was extraordinary; one filled with hope, resiliency, vigor and poise. Mandela was a man of great wisdom who used that insight to rally a nation to fight for equal rights of all mankind. He truly exemplified “change” and served as proof, that one man determined to do what is in the best interest of all humanity can earnestly made a difference not only in the life of an individual, but an entire nation. 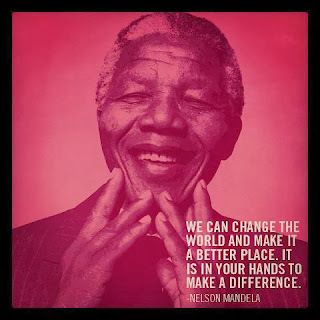 May we forever celebrate the life and legacy of “Madiba”; an amazing human being by emulating the works that he did, because we too “can change the world and make it a better place”, as it is in our hands to do so.